Cuban Missile Crisis 50th Anniversary: What this Cold War crisis should teach us about foreign policy today. Fifty years later, this famous moment of Cold War history remains strangely misunderstood. AP/Wide World Photo/U.S. Department of State. The Cuban missile crisis broke out 50 years ago this month, and its lessons on weakness, strength, and compromise have been recited ever since by politicians, pundits, and historians. The problem—which has plagued U.S. foreign policy time and again—is that these lessons are myths, based on sheer lies about how the crisis began and how it ended. One of these myths has been thoroughly exploded (though many eminences seem not to know it). This is the notion that President John F. Kennedy got Soviet Premier Nikita Khrushchev to back down and remove his nuclear missiles from Cuba entirely through the threat of force. In fact, as revealed by JFK’s secret tape recordings of his meetings with senior advisers (evidence that’s been available at the Kennedy Library for 25 years now), the two leaders brokered a deal: Khrushchev would take his missiles out of Cuba; Kennedy would take his very similar missiles out of Turkey. But the other myth, no less pernicious in its impact (and no less false), still endures. This is the legend that Kennedy cowered before Khrushchev at a summit in Vienna in the spring of 1961 and that, as a result, the crafty Communist aggressively deployed missiles in Cuba thinking the young president was too weak to respond. In fact, however, the evidence—much of it declassified a decade ago from the Kremlin archives, and recounted in Khrushchev’s Cold War, a superb book by Aleksandr Fursenko and Timothy Naftali—reveals that it was Khrushchev who shipped the missiles out of weakness and insecurity. Khrushchev did exploit what he saw as Kennedy’s weakness, but he made his move at a different time, about a different place: Berlin in the summer of 1961. And the abject failure of that ploy, the determined resistance of JFK, so riled Khrushchev that he sent missiles to Cuba a year later as a desperate effort to compensate for what he now saw as American superiority. Let’s back up. At the end of World War II, Soviet troops occupied eastern Germany; the U.S., British, and French armies occupied sectors of the west. With the onset of the Cold War, the borders hardened into two separate countries. Berlin was an anomaly: a city 100 miles inside East German territory, itself divided in two—East Berlin and West Berlin, the latter a Western enclave and a prosperous contrast to the surrounding poverty. In 1948, Stalin mounted a blockade to isolate and ultimately take over West Berlin, but the U.S. Air Force kept moving in supplies. Unable to block the airlift, Stalin called off the blockade. In 1959, Khrushchev mounted an effort to take over all of Berlin, but President Dwight Eisenhower resisted, and the two reached a provisional truce at Camp David. In 1961, after the Vienna meeting with Kennedy, Khrushchev renewed his assault, announcing that if the West didn’t sign a treaty turning over all Berlin to East Germany, there would be war. Kennedy resisted, too, and in fact the Berlin crisis of August 1961 was nearly as tense as the Cuban crisis of October ’62. At one point, U.S. and Soviet tanks faced each other, within firing range, across a checkpoint for 25 hours. Finally, Khrushchev backed down. Around this time, thanks to new photoreconnaissance satellites, the CIA and the Pentagon began to realize that—contrary to the fears of a few years earlier (fears that JFK had exploited in his 1960 presidential campaign)—there was no “missile gap.” Or, rather, there was a missile gap, but America was way ahead of the Soviet Union, not the other way around. For years, Khrushchev had boasted that his factories were cranking out ICBMs “like sausages.” In fact, though, he had nothing; the missile program was in total disarray. And now the Americans were calling his bluff. The Communist Party of the Soviet Union was about to hold its annual congress. Khrushchev was already coming under attack for backing down in Berlin, both from the Kremlin’s hard-liners and from China’s more radical Communist Party, which was competing with the Soviets for Third World allies. The balance of forces with rivals, to the east and west, was palpably shifting against him. The Soviet premier had not given up on grabbing West Berlin, but he knew he had no leverage. If the United States did launch a nuclear strike, he wasn’t even sure that any of his missiles or bombers would be capable of retaliating. Khrushchev did have a fair number of medium-range missiles, so he shipped them to Cuba, to put them within firing range of the United States. If he could install them without notice, then announce another gambit on Berlin (as he was planning to do in November 1962), those missiles would give him something to bargain with. But the American U-2s spotted the missiles. And once Kennedy announced that they had, Khrushchev knew he would have to pull them out. The question was how to do so without suffering another humiliation. Everybody around the table fiercely opposed the trade, saying it would destroy NATO, weaken our standing in the world, trigger all kinds of disasters. Toward the very end of the discussion, the only adviser agreeing with JFK was George Ball, an undersecretary of state who would later be the Johnson administration’s sole dissident on escalation in Vietnam. Kennedy ignored the overwhelming majority of his aides and instructed his brother, Attorney General Robert Kennedy (who also opposed it), to go tell the Soviet ambassador that he would take the deal—but only if it was kept secret. And it was, for the next 25 years, until the tapes were about to come out and a few of JFK’s advisers decided to reveal the truth pre-emptively—though even then, they didn’t say that they opposed the trade. The resolution of the Cuban crisis may hold some lessons for crises today. First, antagonists should stay in touch with each other. 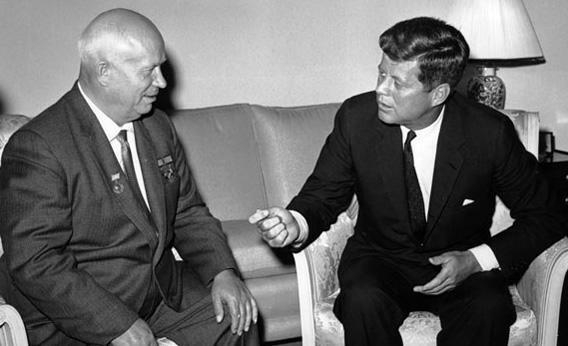 There was no telephone contact between Kennedy and Khrushchev in October 1962. But they did send telegrams back and forth, and Kennedy maintained a back channel through the Soviet embassy—even as ships and submarines confronted one another, troops were mobilized, and, in one particularly tense moment, a U-2 spy plane was shot down. Without those communiqués, the crisis might easily have escalated into war. Second, at some point, one side might clearly have the upper hand, in which case it should seek ways to give the other side a way out. This doesn’t necessarily mean surrendering the interests at stake. The Jupiter missiles that JFK traded weren’t much good anyway. The United States was about to station new Polaris submarines in the Mediterranean; each sub carried 16 nuclear missiles and was less vulnerable to attack. The United States, in other words, gave up nothing in military capability. Third, there is no contradiction between striking a deal and maintaining vigilance; compromise is not the same as appeasement. According to a cleverly titled new book by David Coleman, The Fourteenth Day: JFK and the Aftermath of the Cuban Missile Crisis, disputes continued for months after the Turkish deal was struck, and tensions occasionally flared, over the terms and timing of the withdrawal of Soviet weapons from Cuba. Kennedy held his ground. But neither side stormed off or retriggered the crisis. Fourth, there should be no illusions that the resolution of one crisis will spawn an era of peace. The Turkish trade didn’t save Khrushchev’s face quite enough in the end. Two years later, he was ousted by Kremlin hard-liners, who then proceeded to fund a massive ICBM build-up to match what the United States had already started to do. The Cold War was matched, and fueled, by a nuclear arms race for another 30 years. Still, never again was there an armed confrontation over Berlin or Cuba. The current standoff with Iran over the state of its nuclear program is hardly as intense as the Cuban crisis, but it bears some of the same patterns. Under tremendous pressure, in this case financial, Iran’s leaders are offering compromises to ease the crisis. Their terms to date are unacceptable—they’d require the West to call off the sanctions before Iran stopped enriching uranium—but that doesn’t mean the door to talks should be closed. We don’t know the Iranians’ precise motives or how they assess the balance of forces. They might simply be trying to keep us dangling, but they might genuinely be looking for “some out,” as Kennedy put it. Unless we want war (and some do), it’s worth extending and paying close attention to any feelers. The Cuban missile crisis—the reality, not the myth—offers some pointers on how to do that.